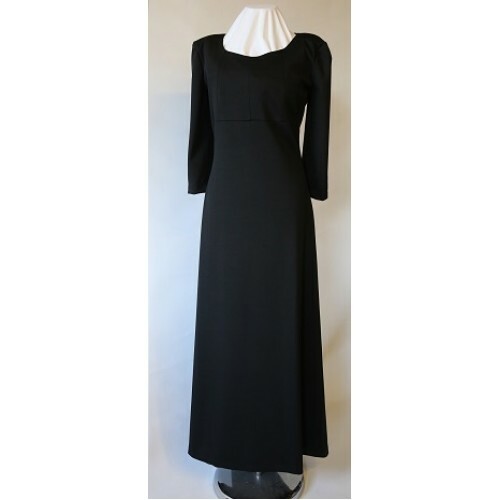 Hand made in the UK from black polyester/ elastane fabric for ease of wear this dress is full length with three quarter sleeves. The dress has added fabric in the lower half to allow for additional comfort when performing & playing cello for example. Available in a full range of sizes and lengths ( see drop down box options). Wash / care instructions - low temperature wash ( 30c) and low heat drying. Iron with a low temperature iron as needed from the inside. Length - this is the length measured from the nape of the neck down to the lower edge of the dress at the back. This dress can be customised, by for example shortening/lengthening the sleeve length, adding trims etc and other features to suit. Our aim is to make available a classic style dress that is affordable and available at short notice across a large range of sizes & fittings.